LG put it on as soon as it came in the mail! 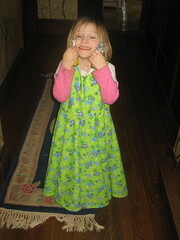 Then she wore it to the family birthday party that afternoon, and then to the first part of Easter the next day. Check out Suzanne’s creations at Cloth Beginnings, she’s got some wonderful talents. I’m impressed she’s getting out of bed each day pg with #3 and dealing with 2 kids under 5, much less creating cool things, but that might just be my own memories coming back to haunt me!